As we look forward to the new year of 2015, it is the time of the year for people to put behind them the old year of 2014 and make new resolutions for the upcoming 2015. Nobody is looking more forward to 2015 than Suarez. The Barcelona forward is looking at putting some of the mistakes and incidents of 2014 behind him as he gets ready to welcome 2015 with open arms. Most of us do around this time start to put together a list or at least come up with ideas to what we will be looking at improving in our lives or ourselves in the New Year that approaches. The New Year’s resolutions are often something that we tend to hold on to earlier in the year but forget about it as the time moves on. Suarez is probably aware of this and he knows that unless he puts it in writing there is no resolution that can survive the test of time. As I put myself in his shoes for a minute and thinking of what could possible resolutions he could have for this New Year, these three come to mind. He tasted Serbian and lately Italian, so the next logical tasting experiencing as to be Portuguese. As he looks at expanding his horizons he will look at 2015 as the year that he will sink his teeth into some Portuguese delight. There are plenty to choose from in Spain, and he might not even have to travel too far to find something fresh and tasty. 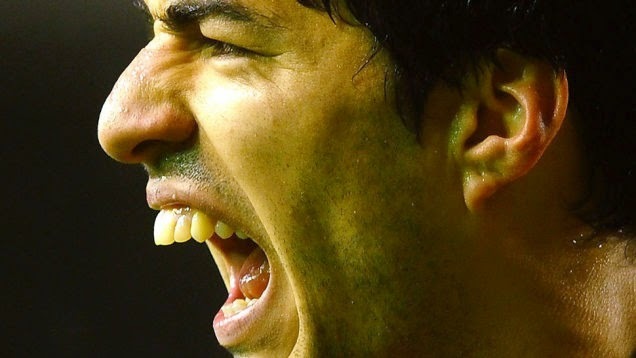 Much has been made of Suarez bite but nobody has mentioned his over bite. 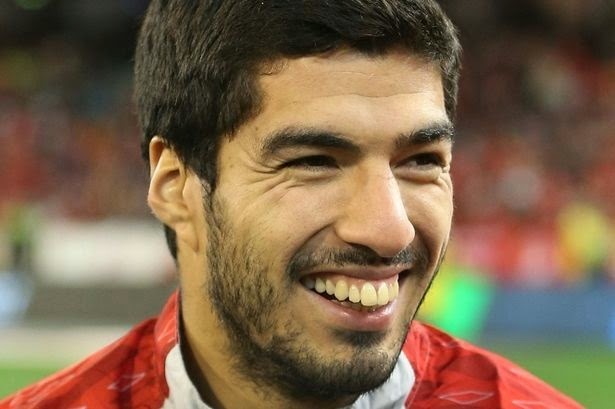 He looks like a Uruguay version of Jar Jar Binks, or a poor man’s Ronaldinho if you will. He needs to get those choppers checked out and something put in place to fix that. He doesn’t bite people, instead folks run into his teeth on a regular basis, and that alone can be fixed with a visit to the doctor. So much as made up of Suarez gaining some weight prior to his start of the season with Barcelona, but let’s face it, Italian food is full of carbs and he feasted on it this summer. With that in mind we all know that the number 1 resolution in the world is losing weight. Who wouldn’t like to drop a few pounds, especially after the holidays, and Suarez is no different. I just think to do it alone it will be very difficult so he will need help. Jenny Craig could be the necessary help he needs to shed some pounds and get back into shape as he kicks off 2015. If he will keep or even make these resolutions we will never know, but one thing is sure, he will be someone that I will follow closely in 2015, not just for the possible incidents that he may headline but also for the quality he brings on the field.